This 4n1 Tropical Combo is a great addition to any party! You can rent this Wet or Dry. 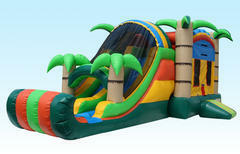 This Combo Bounce house features a large bounce area, a basketball hoop, dual ladder climb that leads to a dual lane slide that either ends at a bumper if rented dry or splashes down into a pool if rented wet. The set up area for this unit is 40Lx20wx16H. You will need two oulets for us to plug into, if renting at a park, you will need to add a generator to power this Combo Bounce House and can only be rented dry. The slides on this combo are 8ft tall. We have a lot of Water Slide rentals to choose from, check our water slide section for more option of bigger inflatables. You will need (2) dedicated outlets located within 75 ft of where we will be setting up. We carry extension cords but willnot run over 75ft from an outlet because of fire safety.